Food Pyramid - How Much Salt is in Your Ready Meals? Home > Food Pyramid Hints and Tips > Food Pyramid - How Much Salt is in Your Ready Meals? Did you know that for the average adult, 75% of daily salt intake doesn’t come from the salt we use in cooking, or sprinkle on our food before we eat? It is actually concealed in processed foods, so unless we read the label carefully, we are often unaware how much salt we are eating. The Food Standards Agency is so concerned about the high levels of sodium (the proper name for pure salt) in our processed meals that it has developed a new advertising programme to inform us of the problem, as well as urging the food industry to reduce salt levels in processed foods. Eleven and over – adult salt levels. It’s important to understand that these are maximum levels – wherever possible children should have less salt than the maximum. 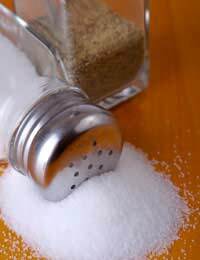 Eating too much salt can increase your risk of developing high blood pressure, heart disease and even stroke. When buying processed and prepared food and ready meals, check the salt level per 100 grams. A quick way to check the level of salt is to remember that a food would be classed as high in salt if it contains more than 1.5 grams of salt or 0.6 sodium per 100 grams of food , while a low salt content would be 0.3 grams of salt or 0.1 grams of sodium per 100 grams. And the rule for salt versus sodium is simple. Sodium figures should be multiplied by 2.5 to get the salt figure – this is because salt contains other elements than pure sodium. All of which make it vital to understand the food labels and to check the levels of salt or sodium that common ready meals contain. It can make a huge difference to choose the low salt option, but there is also quite a difference between food producers. As an example, a 450 gram Sainsburys Shepherds Pie contains 5.9 grams of salt, or 98.3% of the recommended adult intake, while a Marks & Spencer Shepherds Pie weights 400 grams, and contains only 4.8 grams of salt or 80% of the recommended daily intake – of course this is, in part, because the M&S pie weighs less. So it is good to know that the Tesco Shepherds Pie weights more at 500 grams and let has only 3.8 grams of salt or 63.3% of the recommended daily intake! Children’s food needs to be even more carefully considered. Looking at four major brands reveals quite a range of salt in the meals on offer. Assuming that we’re selecting a meal for a child between seven and eleven, we might choose the Asda More for Kids Shepherds Pie at 300 grams which contains 2.3 grams of salt, or 46% of their daily intake, while the Sainsburys Blue Parrot Café Shepherds Pie (with baked beans) is only 250 grams and contains 1.8 grams of salt or 36% of the recommended daily intake, while the Tesco Kids Shepherds Pie weighs only 235 grams and has 1.5 grams of salt, equating to 30% of the daily guideline intake while the Marks & Spencer Children’s Shepherds Pie is the lightest in weight at 220grams, but also the lightest in salt at 1.1 grams or a mere 22% of the recommended daily intake.